Help your fundraiser run smoothly! 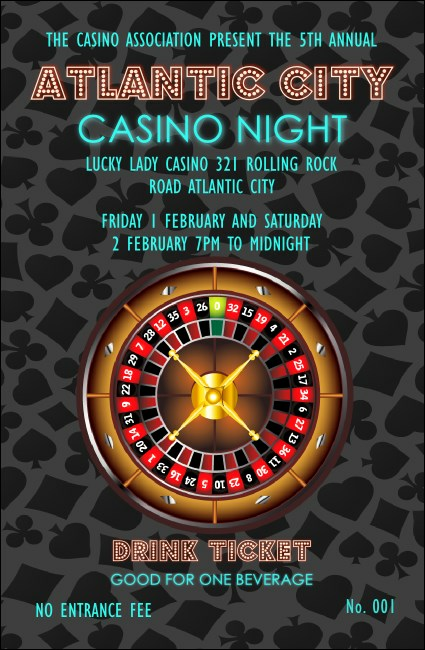 Distribute the Casino Drink Ticket to guests who are ready to have some fun and bet some money for a good cause. A colourful roulette wheel sits in the middle, with grey and black card suits in the background. Your event details stand out on this template in bright blue text. From poker to roulette, find the right ticket for every game at UK Ticket Printing.